The gografis, Palembang is located on the 2 ° 59'27 .99 "LS 104 ° 45'24 .24" BT. Palembang City area is 102.47 km ² with an average height of 8 meters from the sea surface. Palembang City location is strategic as it passed by way of Cross-Island route connecting between the Sumatra region on the island of Sumatra. In addition, there are Palembang City Musi River - Bridge over by Ampera - which functions as a means of transportation and trade between the region and is the City Water and consists of 16 districts and 107 villages. Musi river which is located in South Sumatra Province, Indonesia. With length 750 km, this river is the length of the second pitch on the island of Sumatra. Since the Sriwijaya Kingdom, the river is famous as the main means of public transportation. Musi River on the edge there is a Port of New Boom and the Museum of Sultan Mahmud Badaruddin II. Ampera bridge is a bridge in the city of Palembang, South Sumatra Province, Indonesia. Ampera bridge, which has become a kind of symbol of the city, located in the middle of the city of Palembang, Ulu across the region and across Ilir separated by the Musi River. Development of this bridge started on 16 September 1960, after the approval of President Soekarno. Development costs are taken from Japan's war reparation funds. Not only the cost, using the very day the bridge experts from the country. Initially, the bridge, the bridge was named Bung Karno. 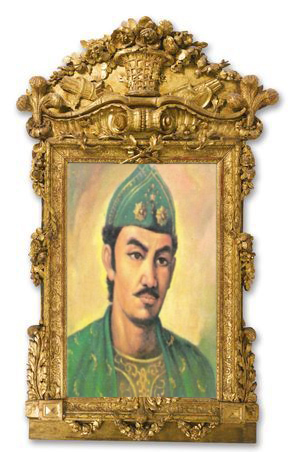 According to historian Djohan Hanafiah, as name of the form of a tribute to the first President of the Republic of Indonesia. Bung Karno are seriously contend Palembang residents desire to have a bridge on the River Musi. Dedication bridge done in 1965, and reinforces the name as the name of Bung Karno bridge. At that time, this bridge is a bridge terpanjang in southeast Asia. After the political upheaval occurred in 1966, when the movement of anti-Soekarno very strong, the bridge was also changed to bridge Ampera (Suffering Amanat Rakyat). Waiting for New Faces bridge Ampera. 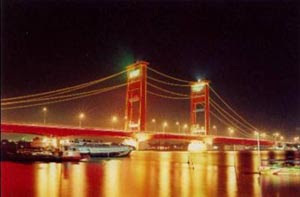 Around 2002, there is a discourse to restore the name as the name of Bung Karno Ampera this bridge. But this proposal does not get support from the government and the community. In the beginning, the middle of this bridge can be lifted to the top of the mast so that the body underneath the bridge does not get caught. The middle of the bridge can be lifted with mechanical equipment, two pendulum ballast each about 500 tons in its two towers. Speed of about 10 meters per minute with the total time needed to lift the bridge for a full 30 minutes. At the center of the bridge was a boat with a size of 60 meters wide and with a maximum of 44.50 meters high, can plow through the Musi River. When the middle of the bridge is not raised, the maximum level that can ship passing under bridge Ampera only nine meters from the surface of the river water. Since 1970, the event down the middle of the bridge rise this is not done anymore. The reason, the time used for the bridge is considered to disrupt the flow of traffic on it. In the year 1990, two hanger ballast in the bridge towers is derived to avoid the fall of this second load ballast.